Custom shirt pricing includes your design, printing and shipping in one low price. Pricing is dependent upon shirt quantity and the number of ink colors in your design. We can print on as many different colored shirts as you would like as long as your design remains the same on each individual shirt. Add $2 per shirt for Adult XXL and XXXL sizes and $4/shirt for Adult XXXXL and XXXXXL. Add approximately $2-$4 per shirt for additional imprint locations (i.e. back of shirt). We carry more than 40 shirt colors, 32 ink colors and several shirt styles. What kind of shirt is it? We print on three shirt styles: the Gildan 5000, the Hanes 5250 Tagless and the A4 Cooling Performance Crew N3142. Our most popular shirt, the Gildan 5000, is a standard pre-shrunk, 100% cotton t-shirt. 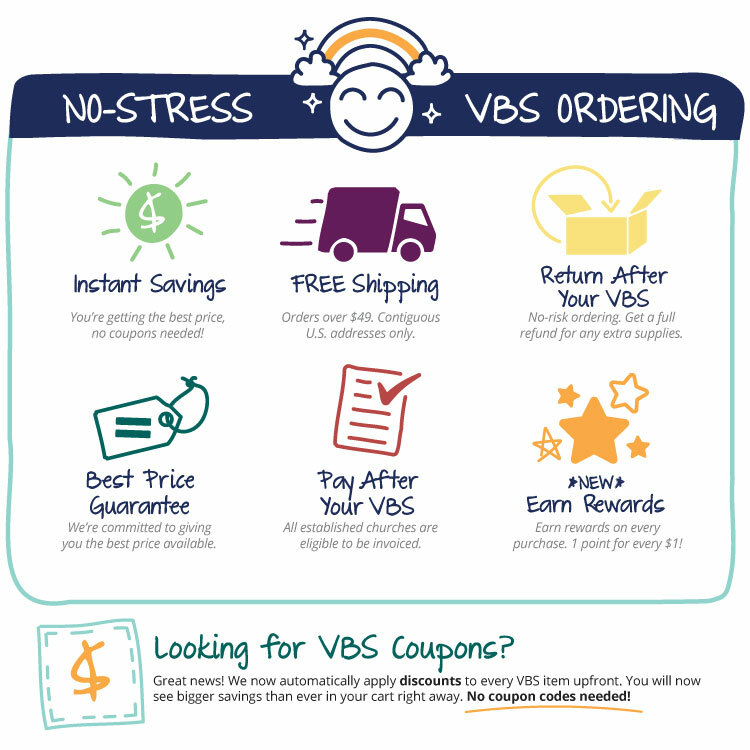 Please see VBS Custom Shirt & Imprint Colors for more information. Don't see the shirt you want? Just ask! Can I add to my order later? We are not able to add to your original order. Any subsequent order is considered a new order and pricing/delivery will reflect an individual order. When ordering fewer than 25 shirts, pricing can be more expensive due to the small quantity. It normally takes about two weeks for the shirts to print, ship and deliver from the date of payment. Please follow the link below for a chart detailing when to place your order. *Holiday between ordering date and the start of VBS. Allow at least one extra business day. Custom T-Shirts are a great addition to your VBS! When you personalize your shirts, you build excitement, boost team spirit and give each student a memorable keepsake from their time at your event. Shirts are available in youth and adult sizes. 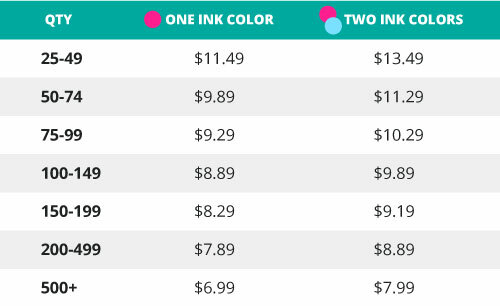 Pricing varies based on quantity and number of ink colors.